Livamol® with BioWorma®: Nutritional supplement containing the natural biological control, BioWorma®, that captures and consumes infective worm larvae (including chemical resistant/anthelmintic multi-resistant larvae) within the manure of grazing animals. This is exciting. Finally an APVMA registered completely natural Worm combating agent. 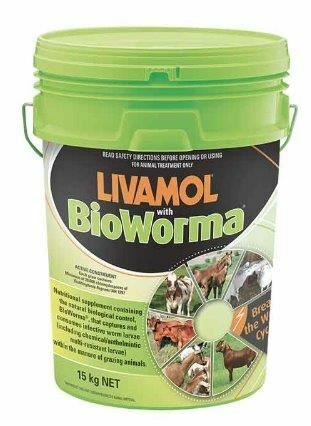 Livamol® with BioWorma® contains the spores of Duddingtonia flagrans, a naturally occurring fungus found in soil and pasture. It is a non-chemical biological control for the free-living stages of parasitic gastrointestinal nematodes or roundworms of grazing animals, which acts by substantially reducing the numbers of infective worm larvae (including chemical/anthelmintic multi-resistant larvae) emerging from manure onto pasture. When fed to grazing animals the thick walled spores pass through the digestive system remaining inert (having no effect within the host animal) and out into the manure. When the infective nematode/roundworm larvae become active within the manure, the fungus sporulates forming a fungal web that captures, paralyses and consumes infective larvae. The commitment to chemical free worm control means an acceptance that there are no silver bullets. Livamol® with BioWorma® is not the answer to all your problems BUT as part of proactive management is a fantastic tool in your chemical free management toolbox. Click here for articles about the efficacy of BioWorma. Click here for Datasheet with dosage recommendations and use instructions. You'll notice the instructions recommend worming with chemical wormer before commencing BioWorma. If this is not an option for you then talk to us about other chemical free management options. Available in 7.5kg and 15kg tubs. Price shown is for 7.5kg tub. If I feed BioWorma® for 3 months will it establish on my farm? No. Once the fungus has consumed the larvae in the manure it will die. Is BioWorma® affected by seasonal change? Does it affect dung beetles or earthworms? There are no negative effects on non-target soil nematodes, earthworms, microarthropods, soil bacteria and fungi. Beneficial insects feeding or breeding on manure (e.g. dung beetles, fly larvae) are not negatively affected. Please note due to the weight of this product an additional freight charge may apply. This will be confirmed with you after ordering and you will be given the option to cancel your order if you do not wish to pay additional freight. At all times we do our best to minimise freight to you and often subsidise freight in order to get products to you. Contact us for more info or a pre-order freight quote.